On September 28, we’ll be celebrating our 25th anniversary. For this special occasion, we’re inviting all our partners and clients to a massive party at Café Local. We’ve chosen Café Local for its unique atmosphere and its top location at the trendy Southside of Antwerp. The perfect venue for our 25th anniversary! The presence of all our partners and clients is all we wish for. However, if they want to give a gift, we will be grateful for a donation towards our charity Kiwanis. Deltalink is active member of Kiwanis Club Mechelen Beiaard. We are a part of Kiwanis Belux and Kiwanis International, a service organization dedicated to changing the world one child and one community at a time. We share in the commitment of Kiwanis International to assist in solving problems of international concern through participation in Kiwanis International programs. We believe that as a group, we can achieve what individuals cannot do alone. We meet at Salons Van Dijck, Mechelen on the second, and fourth Tuesday of each month at 8:00pm. We are 20 members strong and have been serving the community and the surrounding area since 1982. We are very proud of the projects that we have completed in the past and we are always planning new ones that will be fun to do and beneficial to the community. Free therapeutic counseling of young people between ten and twenty years old. TEJO is currently present in Antwerpen, Brasschaat, Brugge, Gent, Turnhout, Kortrijk, Lier, mechelen, Oostende, Ronse and Schoten. The Kiwanis Dolls make Hospitalized Children’s Experience a Little Sweeter. The Kiwanis dolls are simple white fabric doll which are distributed to children and allow the children to color them in to represent themselves or someone else. The gift of a Kiwanis doll can serve many purposes. A child can draw on the doll with markers, distracting him from discomfort and boredom. Because the doll is soft and squeezable, it can be a comfort when the child is anxious. The child can express his fear or unhappiness by drawing a face on the doll. Also, the child can mark on the doll the injury or pain she feels. This allows adults to discuss concerns or pains more objectively with the child. When medical personnel use the doll to show a child what will happen during the procedure, it helps the child understand. Each child keeps his doll when leaving the hospital, a positive reminder of the hospital visit. 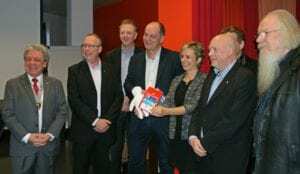 Kiwanis Mechelen Beiaard donates the Kiwanis dolls to the hospital AZ Sint Maarten in Mechelen. 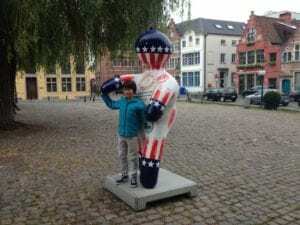 If you walked through some cities in Luxemburg and Belgium, you must have come across some giant dolls. Did you wonder what they were doing there? Well, it is very simple! After being exhibited throughout the city, these dolls, painted by artists who volunteered to freely contribute to the cause, are being auctioned. The funds raised on these occasions are utilized by the Kiwanis clubs to provide hospitals with the rag dolls. Launched in Luxemburg’s Grand Duchy in 2015, the project called “Kiwanis International Dolls in Town” has already contributed to comfort and reassure thousands of hospitalized kids. Kiwanis International is now turning its attention to the elimination of MNT or maternal/neonatal tetnus. The Eliminate Project is focused on raising $110 million dollars to eliminate a disease that kills one baby every nine minutes. And we will do it by helping some of the poorest and most underserved women and children in the world together with UNICEF.